I'm going back a bit for today's project. I was going back through some data on my blog and discovered a whole section of projects that I NEVER posted! I actually created this card in MAY for my private swap group the GoDivas. I say quirky because at first glance, it seems like these images really have nothing to do with each other, but they actually do work together beautifully. 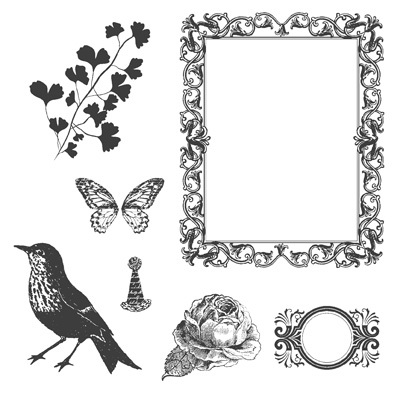 For my card, I stamped the frame image with Midnight Muse and offset it twice on the main panel. The leaves were stamped in the frame to fill the 'picture'. 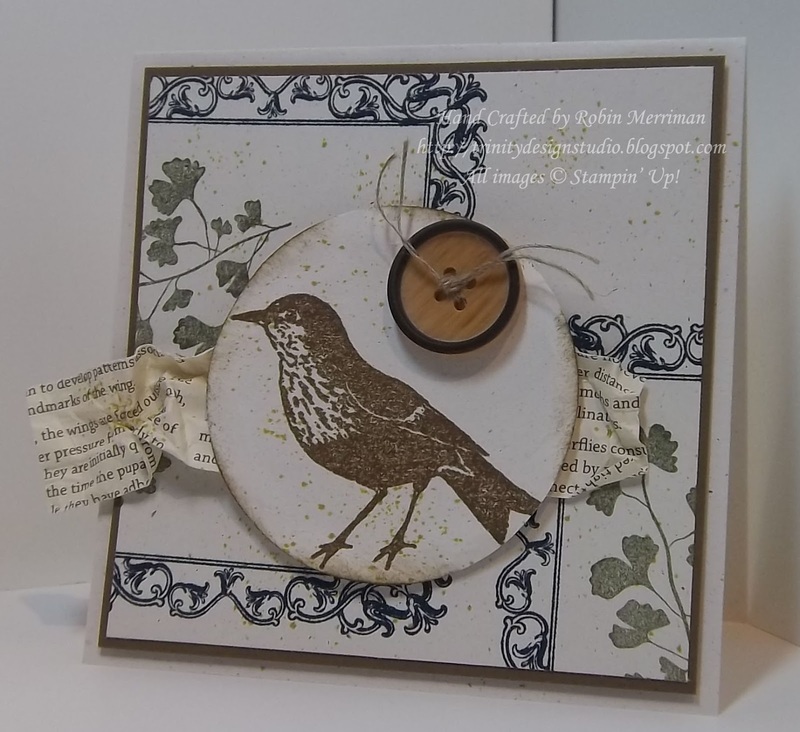 The focal point is the bird stamped with Soft Suede on Naturals Ivory and punched out with the 2 1/2" Circle Punch. 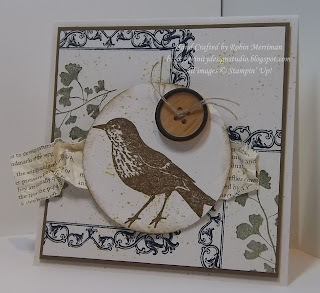 I added the Naturals Button with Linen Thread to the piece and after sponging it with Soft Suede, popped it up on Stampin' Dimensionals. The little strip of First Edition Designer Series Paper was spritzed with water and crumpled. I smoothed it back out and after it dried mounted it underneath the focal image. Lastly, I spritzed the entire card front with a Crumb Cake Stampin' Write Marker and my Color Spritzer Tool for a final accent. This card made me do the stamper's happy dance! Hope today brings you the chance to make something you love and do the happy dance too! Hi Robin! Beautiful card! So glad you "found" it again. :) TFS! It's BEAUTIFUL and has inspired me to put ink on the rubba!! Thanks for the inspiration!